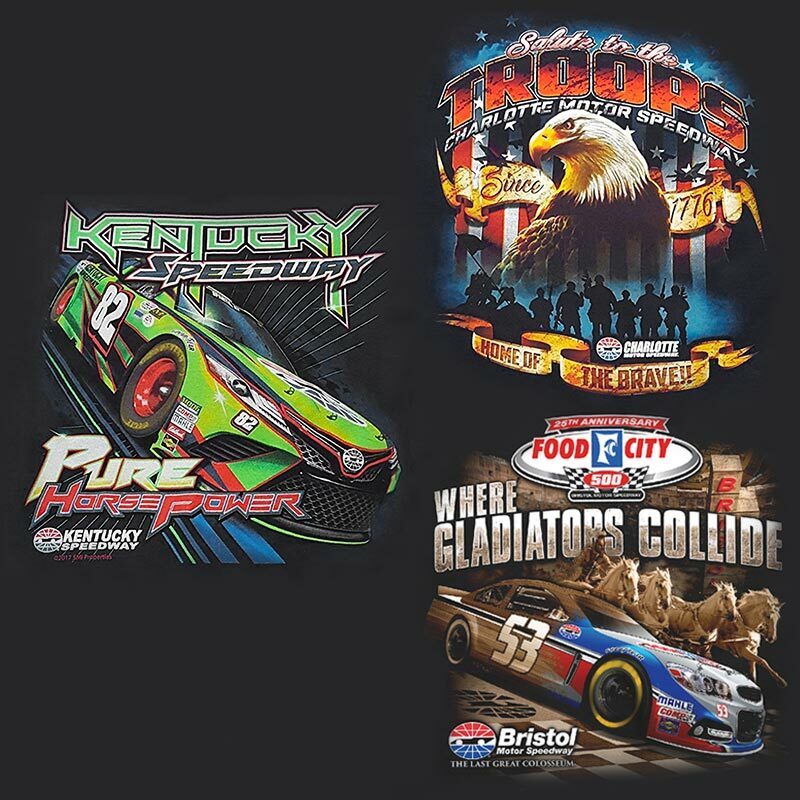 Via the rich tradition in motorsports enjoyed by its parent company, Speedway Motorsports, Inc., SMI Properties has played a significant role in developing corporate sponsorship opportunities. SMI Properties quickly built a reputation of credibility and reliability, offering quality merchandise, excellent workmanship and thorough account management and service. SMI Properties’ commitment to understanding the industry in its entirety has led to long-standing relationships with many of motorsports’ top drivers, team owners and corporate sponsors, as well as NASCAR. That same commitment and loyalty is carried to its fans, clients, and their customers. As a full-service, vertically integrated company, SMI Properties can tailor a complete turn-key, employee-based or retail program. From concept development to distribution of the final product, the vertical integration allows for the elimination of middle-men layers. SMI Properties employs an extensive, full-service art department with the capability to control a project from concept to finished product. Specialized artists utilize state-of-the-art computer software and production equipment capable of producing the highest quality, cutting edge designs available, with an expertise in a wide variety of licensed designs. 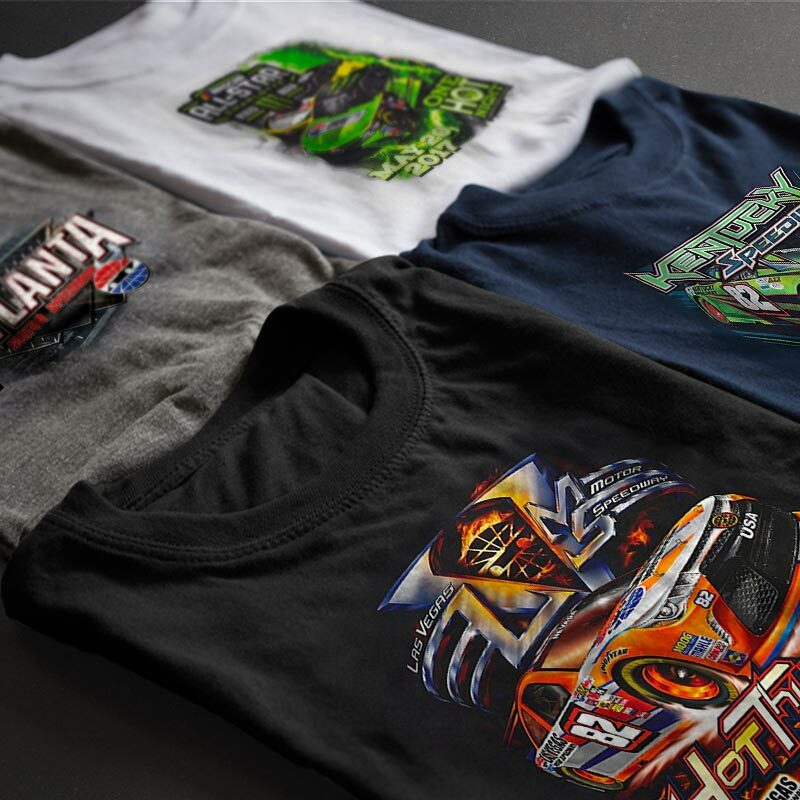 SMI Properties’ graphic artists and separation specialists are routinely called upon to create multi-color, high-end simulated process prints for a wide variety of corporate sponsors. In addition, licensor requests and changes can be expedited because of SMI Properties’ ability to produce complete color separations in-house, just steps from the production facility. SMI Properties has a complete in-house screen printing operation that utilizes 12- and 16-color, state-of-the-art equipment designed for high-definition imprints with graphic detail. In addition to industry staple colors, the SMI Properties screen printing department specializes in dark color apparel imprinting, maintaining the color quality and intricate detail of the design. The company’s production facility is capable of producing 96,000 impressions per day. SMI Properties’ screen print specialists are also well-versed in modern specialty ink applications. Some of the specialty selections available to clients include polychromatic ink, foiling application, crystalline ink, suede, suede puff, ultra gel and high density ink applications. The SMI Properties embroidery department, like all of the company’s production operations, functions completely in-house and can control all steps of the embroidery process, from initial concept, to digitizing, to completed garment\ and its distribution. SMI Properties can create designs and art from a client’s concept or digitize client-provided art. Technical knowledge of embroidery and appliqué techniques, relevant to matching the preferred garment, is then applied to meet all client needs and specifications. Via growth, acquisition and utilization of SMI's eight speedways, SMI Properties has developed a merchandising operation to fully complement the vertical structure of the company. SMI Properties operates high-traffic retail gift shops, year-round, at SMI speedways. 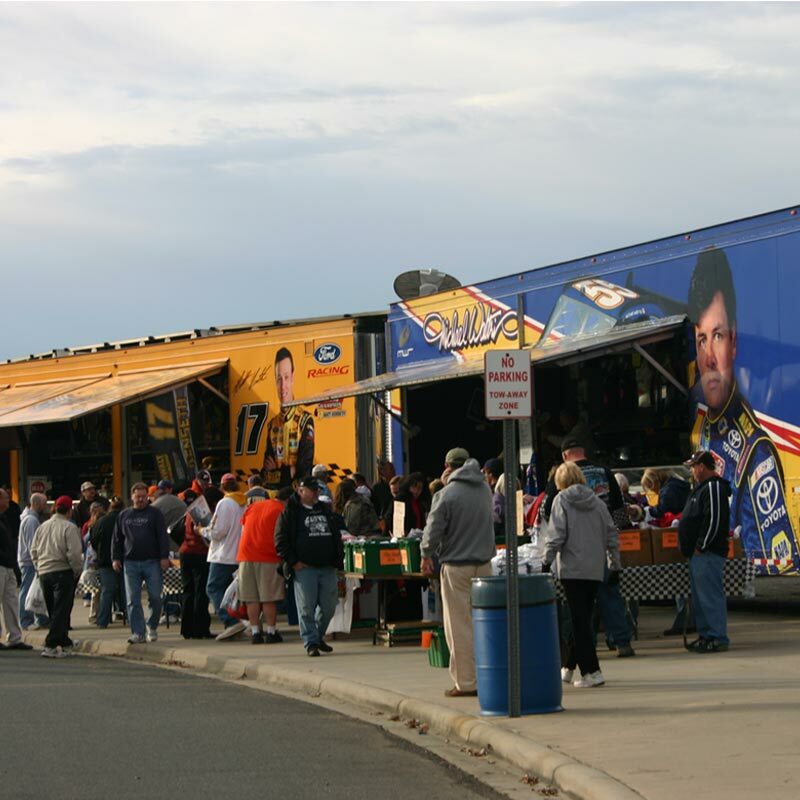 For major events SMI Properties will supplement the gift shops, and its other permanent concourse souvenir locations, with a traveling fleet of merchandise trailers to further increase venue presence. 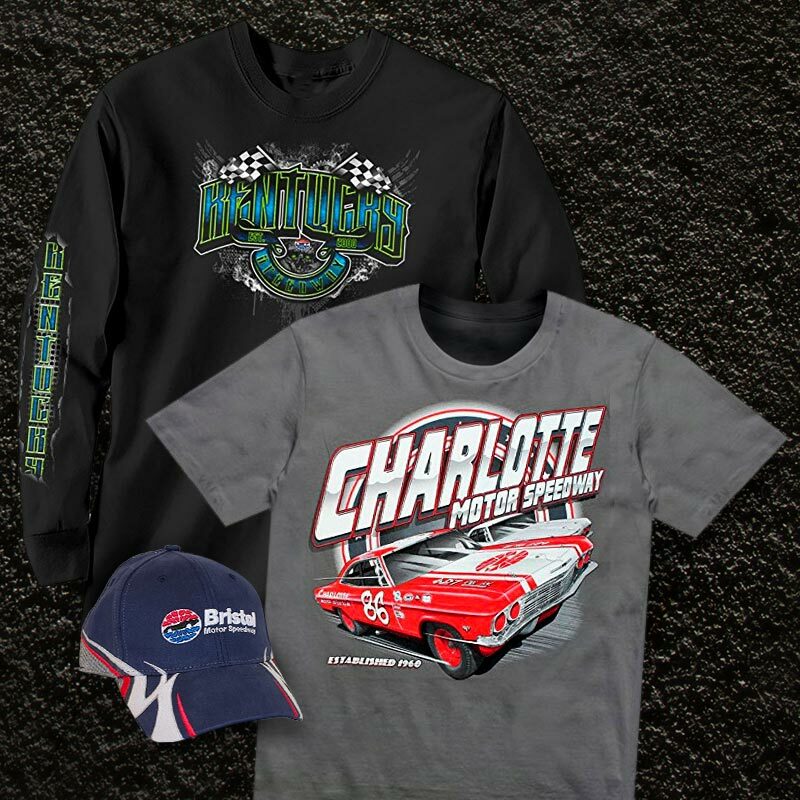 SMI Properties’ trackside merchandise subsidiary, “Sports Design”, provides race team, driver and corporate sponsor clients with their own “custom retail rigs” at every NASCAR race from February through November. “Motorsports by Mail”, SMI Properties’ e-commerce and catalog company, supplements its 24-hour, 7-day-a-week retail e-commerce operation with periodic special program flyers to more than one million race fans. These additional sources of distribution have increased the effectiveness of SMI Properties’ program to source, design, manufacture apparel, inventory and distribute any item, collectible or gift. SMI Properties’ manufacturing and warehouse operation is located within a 53,000+ square foot, state-of-the-art facility, adjacent to its corporate offices in Harrisburg, NC, a short distance from Charlotte Motor Speedway. SMI Properties has the capability to inventory and provide product fulfillment service. 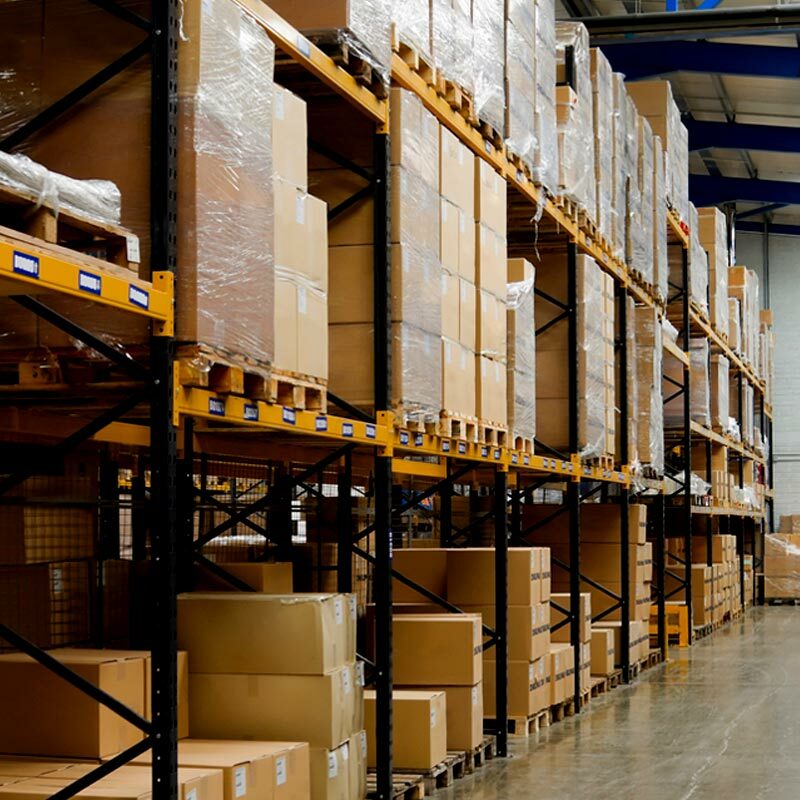 With a selective racking system designed for inventory rotation, the warehouse is able to accommodate more than 500,000 pieces of inventory. All packing and shipping is self-contained and completed at the warehouse facility. SMI Properties’ sewing, folding and bagging equipment can accommodate additional client requested identity or packing requests so the final product can be ready for display or distribution, domestically or internationally. Aside from being the exclusive Golf Cart vendor for Atlanta Motor Speedway, Bristol Motor Speedway, Charlotte Motor Speedway, Kentucky Speedway, Las Vegas Motor Speedway, New Hampshire Motor Speedway, Sonoma Raceway, Texas Motor Speedway, and their affiliates which are all owned and operated by Speedway Motorsports, Inc., SMI Properties takes part in the rich tradition in motorsports enjoyed by its parent company, Speedway Motorsports, Inc. SMI Properties has played a significant role in developing corporate sponsorship opportunities. SMI Properties quickly built a reputation of credibility and reliability, offering quality merchandise, excellent workmanship and thorough account management and service. SMI Properties' commitment to understanding the industry in its entirety has led to long-standing relationships with many of motorsports' top drivers, team owners and corporate sponsors, as well as NASCAR. That same commitment and loyalty is carried to its fans, clients, and their customers. 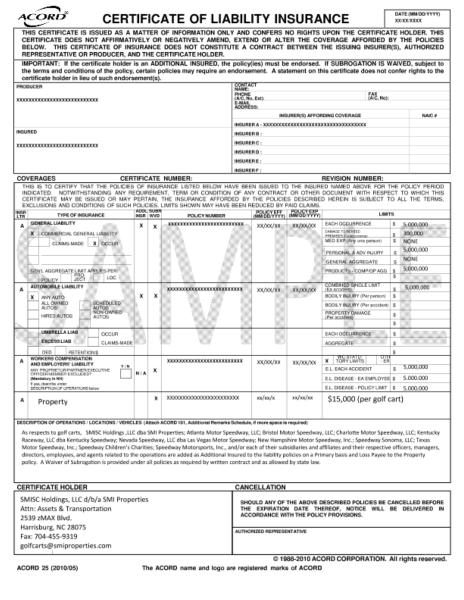 At all times, SMIP and/or the respective SMIP affiliate ("Speedway") Speedway shall mean a motorsports facility owned by a direct or indirect Speedway Motorsports, Inc. subsidiary – Atlanta Motor Speedway, Bristol Motor Speedway, Charlotte Motor Speedway, Infineon Raceway (Speedway Sonoma), Kentucky Speedway, Las Vegas Motor Speedway, New Hampshire Motor Speedway and Texas Motor Speedway. All SMIP affiliate Speedway's, welcomes their guest with handicaps/disabilities and seek to provide wheelchair and EVC friendly accommodations, as well as handicap accessible seating areas. We encourage you to use the Courtesy Shuttles and/or Handicap Shuttles that operate during all NASCAR events in order to travel around the premises. If you have further questions regarding handicap assistance please contact the attending track. Personal Golf Carts, Quads, Scooters (motorized, electric, push, or kick), Mopeds, Mini-Bikes, Dirt Bikes, Off-Road Vehicles, Mules, Gators, ATVs, Segway's, Bicycles, Rollerblades, Roller-skates, and Skateboards are STRICTLY PROHIBTED while on SMIP affiliate Speedway property at any time. We encourage fans to use the Courtesy and/or Tram Shuttles operating during all NASCAR events to travel around the property. Authorized transportation at any SMIP affiliate Speedway, will be limited to authorized credentialed users only. Authorized users shall include Speedway Staff, Event Personnel, Vendors, Sponsors, Media, Team Owners, Team Crew Chiefs, and Team Drivers. ALL authorized users will be required to fulfill 5 million dollar liability insurance requirements, associated with operating said vehicles while on any SMIP affiliate Speedway property, prior to being issued a credential. Any unauthorized usage of said vehicles will be subject to either immediate removal from SMIP affiliated Speedway property. Anyone operating a golf cart without proper insurance coverage and/or credentials will be asked to remove the cart from property immediately. If cart cannot be removed from property, at the discretion of the owners, SMI Properties will allow the cart to be stored at the SMI Properties golf cart compound until the conclusion of the event. However; SMISC Holdings, Inc. d/b/a SMI Properties, its subsidiaries, affiliates, or respective shareholders, members, partners, officers, managers, directors, or employees will not be held liable for any stored cart in any way. ALL refusals of dismissal will result in trespassing and further prosecution. At all times, SMIP and/or the respective SMIP affiliate speedway ("Speedway") reserves the right to revoke golf cart credential and Equipment or Equipment privileges should Company abuse or use improperly. Equipment use is for Business purposes Only. Only validly-licensed drivers who are 18 or older and authorized by company, are allowed to operate Equipment. DO NOT use Equipment as a means for product sampling or couponing. DO NOT take Equipment off of Speedway Property. DO NOT park Equipment in unauthorized areas of Speedway Property. DO NOT leave Equipment unattended unless, the ignition key is switched off and removed and cart is secured by lock and chain. DO NOT allow passenger(s) to sit on or about areas on Equipment not specifically designed for seating including but not limited to, the front cowl or in cargo box. DO NOT allow passenger(s) to stand while Equipment is in operation. DO NOT use cellular phones or personal data devices while operating Equipment. DO NOT operate Equipment while under the influence of any quantity of alcoholic beverages, marijuana, other narcotics, or substances whatsoever, whether or not prescribed by a physician. ALWAYS ensure passengers are seated and ready before operating Equipment. ALWAYS maintain a safe and cautious speed during operation. The maximum speed on all Speedway properties is 25mph unless otherwise posted. ALWAYS use extreme caution in highly congested areas, including but not limited to hospitality and display areas, concession areas, souvenir areas, crosswalks, entrances to infield, etc. ALWAYS use lights at Night. ALWAYS report any accidents or incidents Equipment is involved in to Speedway Security and to the SMIP Golf Cart Compound at the time of occurence. Who can I rent Golf Carts from? SMI Properties is the exclusive golf cart vendor at all Speedway Motorsports, Inc. and affiliate properties for all event and non-event rentals. I do not have the minimum required Insurance and/or a General Liability Policy; can I purchase Insurance through SMI Properties? No. 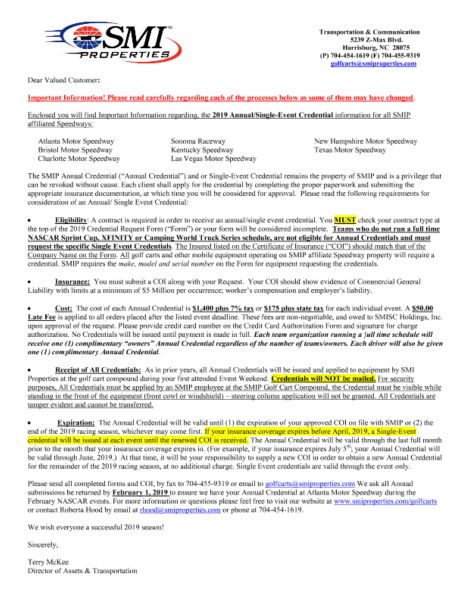 SMI Properties does not sell insurance. We only rent or credential those with the approved Insurance containing $5 million Commercial General Liability per occurrence, this may be obtained by adding an Excess Umbrella to the GL Policy, $5 million Automobile Liability for all personal carts, $15,000 per golf cart Property Coverage Policy for all rented carts. All policies must remain in effect for the entirety of the event period. Can anyone rent or bring golf carts on property? Due to liability and insurance regulations, and to ensure all fans have a safe and enjoyable visit, Golf carts are limited to business use only. We encourage fans to use the Courtesy Shuttles, Handicap shuttles and Trams shuttles that operate during all NASCAR, NHRA, IndyCar, and other miscellaneous events in order to travel around the premises. What do you mean by business use only? 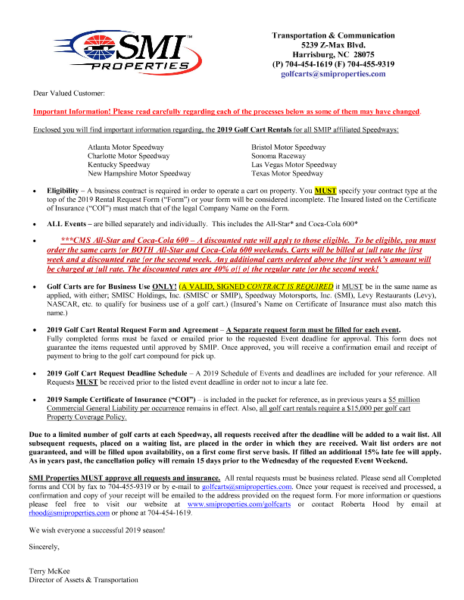 Business use and/or purpose to rent or credential a golf cart includes: Speedway Staff, Event Personnel, Levy Vendors, Souviner Vendors, Sponsors, Team Owners, Team Crew Chiefs, Team Drivers, Media, etc. 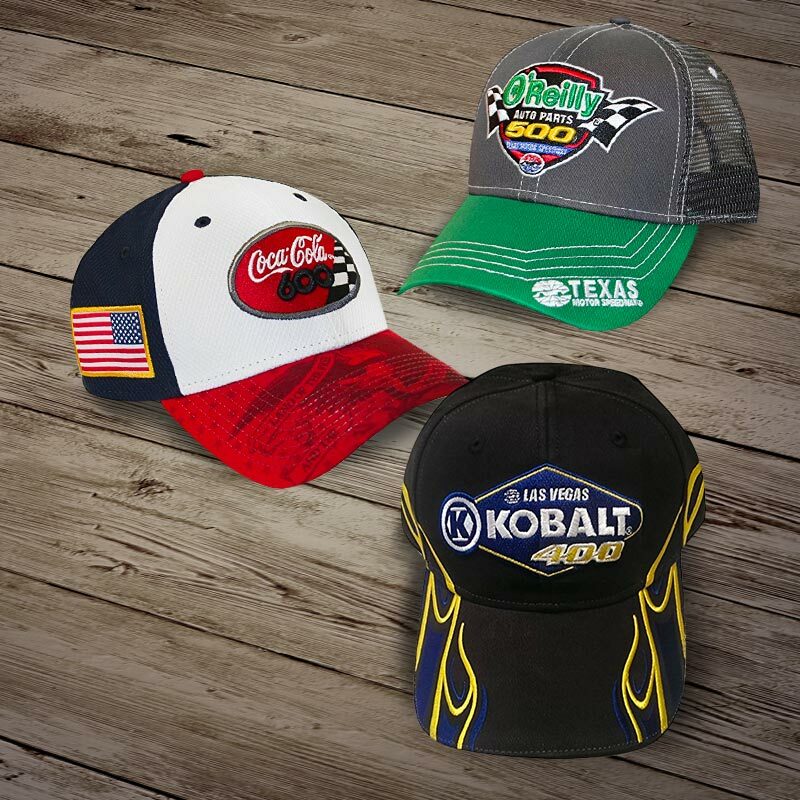 All must have a signed agreement with either SMI, SMIP, Nascar, and/or Levy Restaurants in order to qualify.